Furman and guest editors Christina Garcia, Ann Patchett, and Richard Russo have put together a stellar group of 20 for the anthology’s 85th outing. The stories range in style and tone from Kevin Brockmeier’s “The Brief History of the Dead,” a hauntingly apocalyptic miniature about the emptying out of a mysterious city where people go when they die, to Michael Parker’s noirish “The Golden Era of Heartbreak,” which pushes the jilted lover cliché into new territory. Standouts include Elizabeth Stuckey-French’s “Mudlavia,” a coming-of-ager set at a health spa in the summer of 1916; Ruth Prawar Jhabvala’s “Refuge in London,” about a young girl who, in the late 1930s, sits for a celebrated artist in a German refugee community in London; Nancy Reisman’s richly textured “Tea,” about a doomed affair between a romantic young woman and a married man in 1927; and Liza Ward’s “Snowbound,” about a young girl’s wise assessment of the adults in her life. There are a few disappointments, however. Dale Peck’s convoluted “Dues” takes on a promising urban theme—a creeping dread that “life was just a series of borrowed items, redundant actions, at best repetitions, at worse theft”—as experienced by a man who buys a stolen bike and is discovered and beaten by its owner. But the piece is too convoluted and contrived to nail it. And Timothy Crouse’s “Sphinxes,” about the relationship between a piano teacher and three of his students, is too lengthy for its own good. Guest Editor Patchett notes that in “What You Pawn I Will Redeem,” Sherman Alexie “steps aside to let his character have every inch of the stage,” and his Spokane Indian narrator is indeed winning. 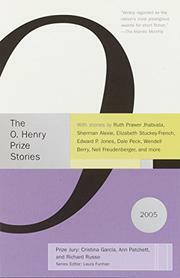 In all, a first-rate sampler of the best from the little magazines (The Georgia Review, Michigan Quarterly Review, The Oxford American, Zoeotrope, Granta) as well as the more commercial (The New Yorker, The Atlantic Monthly).